Check out this week’s coupon offers! We’re giving away free Cool Whip, $5 off Nugget’s Prepared Lamb Dinner, plus $2 off Manischewitz Matzos, $1 off MyChelle makeup products, and Boiron Sabadil allergy-relief tablets. Enjoy this wine with Easter brunch. Crisp, refreshing and dry, with aromas of apple and peach, it is great with hors d’oeuvres, sushi, shellfish or any seafood. This sparkling wine is slightly less effervescent and lower in alcohol content than others, so you can enjoy it with brunch without getting sleepy mid-day. Who could resist these cute little guys? Perfect for your Easter table centerpiece or to decorate the mantle. 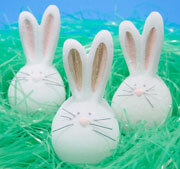 Each little bunny candle has an approximate burn time of 3 hours. Putting together an Easter basket? Throw in some of Zoya’s fun, bright nail polish — we think it simply screams “Welcome to spring!” We also suggest including some of Zoya’s nail polish remover, which also helps clean and strengthen nails and has a surprisingly pleasant lavender scent. Nugget Market joins the Roseville Chamber of Commerce for the Granite Bay Easter Egg Hunt, scheduled for Saturday, April 4th at Cavitt Junior High in Granite Bay. The hunt begins at 10 a.m., with a pancake breakfast beginning at 8 a.m., along with face painting, arts, crafts, music and more. For more information, please call (916) 783-8136. Easter Savings to Dye For! Don’t sweat it this spring for your Easter meal. Come to Nugget Markets for our Prepared Lamb Dinner, available April 8th. Featuring a boneless leg of Superior Farms American Lamb, this meal is expertly prepared in our Nugget kitchens by a team of talented chefs. 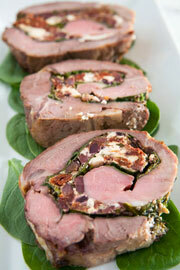 The lamb is seasoned and stuffed with Mediterranean flavors like Feta cheese and Kalamata olives. The chefs roast it rare so it’s simple to reheat and serve to your guests however they like it. You can even tell them it’s your secret recipe — we don’t mind. 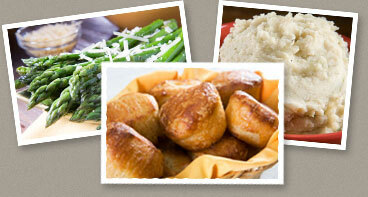 The complete meal comes with potatoes, asparagus and dinner rolls; it serves a family of six and it’s only $60.99 when you bring in our $5 off coupon! 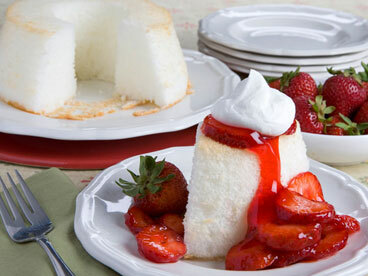 Try Nugget’s Angel Food Cake for a post-Easter-dinner treat that’s light, sweet and satisfying. Topped with fresh strawberries and a dollop of Cool Whip, it becomes the perfect dessert with which to welcome springtime. Cool Whip: free with this week’s coupon! What would Easter be without the beloved tradition of dying Easter eggs? Paas Large Egg Decoration Kits come with a selection of colored dye tablets, plus stickers, a wax crayon and more — suitable for unleashing the artist in anyone. Powerhouse of nutrients: In a mere 70 calories per large egg, you get 6 grams of one of the best proteins available, plus heart-healthy monounsaturated fats and a host of vitamins — including more than 30 percent of your vitamin K needs (crucial in bone health). Eggs are also one of the few sources of the specialty nutrient choline, which aids in memory and brain development. Cholesterol concerns? Sure, eggs are loaded with cholesterol … but don’t worry. While each egg contains two-thirds of the recommended cholesterol budget for the day, studies show that eating eggs daily won’t kick up circulating levels of cholesterol and that egg eaters may have a lower risk for heart disease than egg avoiders. Egg white vs. whole: You’re better off eating the whole egg, because about 40 percent of the protein is in the yolk, along with most of the vitamins and other good-for-you nutrients. More than a dozen uses: Besides eating them hard-boiled, sunny-side up and scrambled, try adding the goodness of eggs to soups (whisk into hot broth), burritos (great with black beans) and sandwich spreads. Eggs also make delicious snacks (make deviled eggs by mixing the yolk with hummus for even more protein).